Don’t Forget About the Younger Athletes! Take Home Message: Over a 2-year period, 5 out of every 100 youth American football players sustain a concussion, and over half of the youth were still symptomatic 21 days post-concussion. Over 45 million youth athletes (6 to 17 years of age) participate in organized sport. Brain injuries in this population, particularly at the elementary and middle school levels, can be alarming since there is little medical coverage during their games and practices. Additionally, we know little about whether brain injuries that occur in their developing brain have negative long-term problems. Therefore, researchers collected data on concussion incidence, risk factors, duration of symptoms, and return to school and sport during 2 10-week youth fall football seasons. Athletes (5 to 14 years of age) with their parents completed baseline surveys to report demographics, years of football participation, history of diagnosed concussion, and mental health history. The researchers employed athletic trainers to attend all games during the 2 10-week seasons. Athletic trainers notified the authors if an athlete suffered a potential concussion. Once a clinician diagnosed a concussion an athlete and their parents completed weekly surveys about concussion signs and symptoms, return to school, and return to sport. The authors defined symptom resolution as no more than 3 symptoms greater than preinjury baseline as reported by both child and parent. The athletic trainers reported 113 potential concussions among 863 athletes (82% of athletes were pulled from the game the same day as the injury), 51 were clinician confirmed, which yielded a 5% concussion incident rate per season. Athletes with a history of concussion or diagnosed depression were more likely to experience a concussion during this study. Following a concussion, 90% of the athletes returned to school within 9 days. Athletes took longer to return to sport (90% returned by 1 month) and to return to baseline symptoms (90% returned to baseline by 2 months). 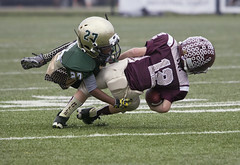 The authors found that youth American football players experience concussions more often than previously reported. It is likely that these estimates are more accurate because the study team provided medical coverage for games that often would lack medical coverage. This finding is consistent with the American Academy of Pediatrics recommendation for athletic trainer coverage as a standard for youth football. It should also be noted that youth athletes took nearly 60 days to return to baseline symptoms despite most athletes being removed from play. Athletes typically recover quicker if athletes are removed from a sport the same day as an injury. Unfortunately, on-field management and return to play at this level are not always managed appropriately. Hence, the authors could be underestimating how long recovery may take in youth football because they created the best conditions for these athletes. This highlights the need for youth football players to receive medical coverage at games and practices, since even when medical coverage was provided youth athletes take a long time to recover. Additionally, due to the prolonged symptom recovery, it would be interesting to see if youth athletes would benefit from a concussion rehabilitation program; however, this would require more medical coverage/care at this level. Currently, medical professionals, coaches, and parents need to be aware of the important role athletic trainers play by providing medical coverage during youth contact sports. Questions for Discussion: How can we get stakeholders involved in youth football to hire athletic trainers to provide medical coverage for games? What are the best ways to educate parents, coaches, and athletes at this level?